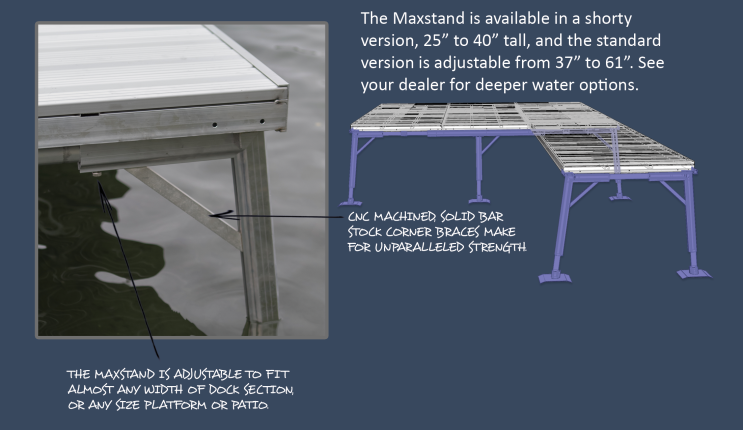 MAX’s Standard Dock was one of the first products that was introduced, along with the patented Maxloc support. It features the “MAX Stack Frame” with CNC machined and pocketed multi-hollow extrusions for strength and superior walk quality in a 4” tall stringer, mill finish dock. Today it also features the SCS Section Connection used on MAX Signature Dock for easy assembly and configuration. This economical dock is available in 10’ sections with pressure treated wood panels, or light weight 8’ sections with grated plastic decking for easy installation. 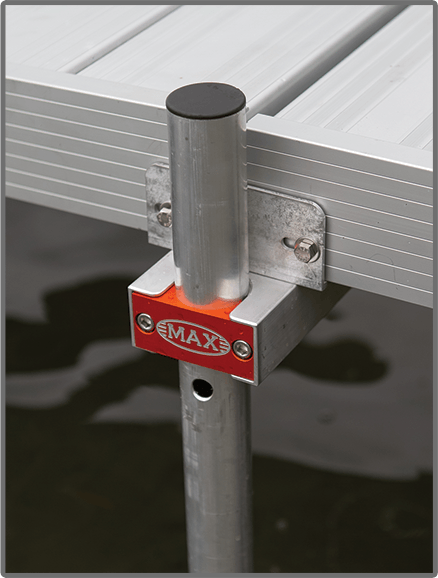 The Maxloc patented cross-arm system has an integral CNC machined clamping system that contacts the entire dock pole. A 2” x 4” extrusion forms the main body, and machined stringer brackets bolt into the clamp system, providing an extremely secure, stable connection point for the dock sections to attach. 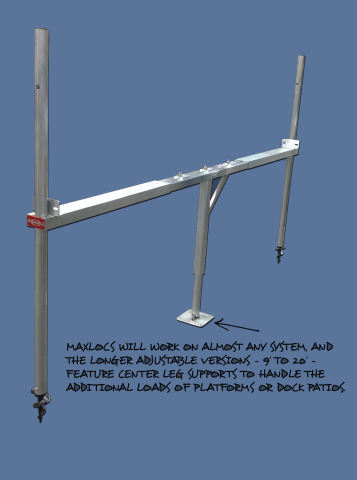 The Maxloc will not sag or slip under heavy foot traffic, and easily out performs lesser supports of cast or stamped material that tend to fail under heavy use. The Maxstand stanchion was developed to provide a strong platform for Max Standard and Signature Docks. It’s 7° angled leg design provides extra stability in the water, and there are no poles protruding above the dock, offering an exceptionally clean, refined appearance. Standard 36” long adjustable poles and larger, heavy duty foot pads are included.